Cause A Scene has been on a bit of a blogging hiatus lately as I’ve been planning out a spring calendar of house shows for 2013 and taking some time to reflect on our first year (more on that next week). There are a lot of things I’m really excited to see in 2013, and one of the biggest things I’m keeping my eye on is the sophomore release from Seryn, out sometime in the first half of this year. If you’re new to Cause A Scene, then you should know that Seryn is the band that started it all for Cause A Scene, setting everything into motion with our first house show back in the Fall of 2011. Over the holidays, our favorite Dentonites (Dentonians?) released a live video of their brand new song “Ivory Black”. In typical Seryn form, the song takes the listener through several movements, ebbing and flowing in tempo with equal parts tenderness and raw emotional energy. “Ivory Black” displays some of the richest harmonies I’ve heard from this band so far with some finely intricate guitar work from lead guitarist Nathan Allen. In short, it stands as one of my very favorite Seryn songs overall and has me even more excited about what is to come from this band in 2013 and beyond. I met Chris Semmelbeck in Midland, TX at a mutual friend’s wedding. Our conversation quickly turned to music and I found out that he was in a band. Later on in the trip, Chris showed me and a group of friends one of the songs that his band had just finished recording. The band was Seryn. The song (if I remember correctly) was “Our Love”. About 6 months after this encounter, Paste Magazine included Seryn in their Best of What’s Next. 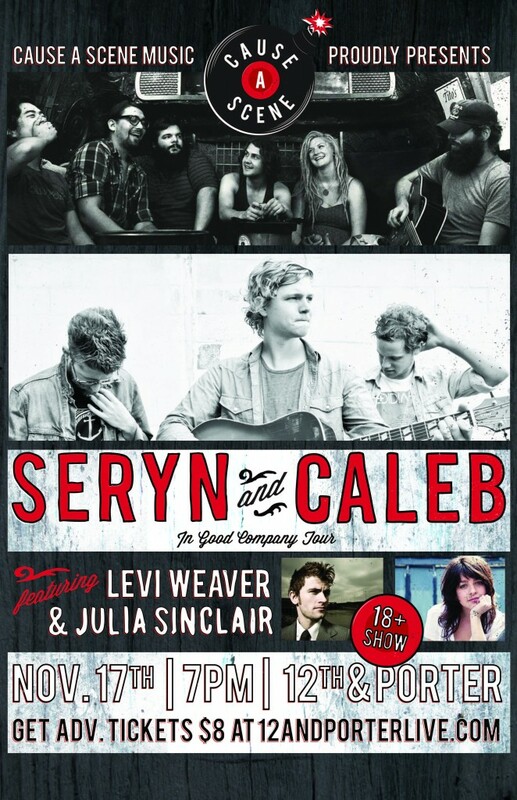 If you haven’t seen Seryn, then you have your chance on November 17th at 12th and Porter. Here at Cause A Scene, we put a high premium on loyalty and being good to those who have been so gracious to us over the last year. 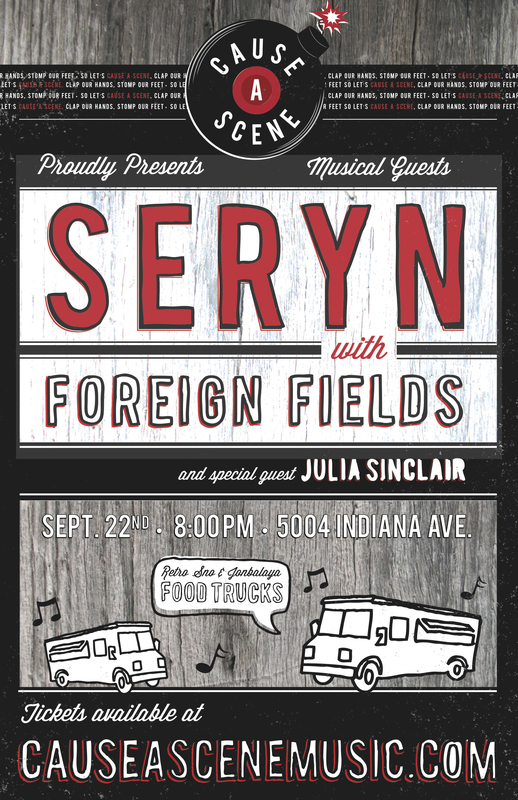 With that in mind, it’s no wonder that we are THRILLED to be presenting our first show outside the confines of our beloved Volunteer State and hosting our good friends Seryn and Julia Sinclair for a very special acoustic performance in a city that is dear to my (Larry’s) heart. On Monday, November 12th, the Capstone will be buzzing with an intimate concert that is sure to be one of the musical highlights for the fall semester for college coeds and local Tuscaloosans alike. 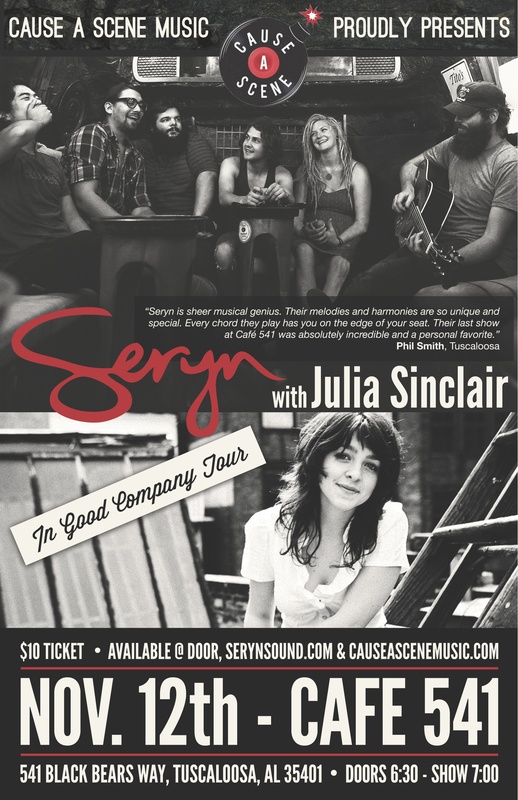 The last time Seryn came to town, the show sold out quickly, so be advised to reserve your spot well in advance. Tickets can be purchased via the link below. It’s time for the rest of the Southeast to get an idea of the scene we’ve been privileged to be causing here in Music City. See you soon, Alabama. And while you’re here, why don’t you check out this gorgeous video of Seryn filmed a few months ago by our pals at SofarSounds. And if you’d like to see Cause A Scene appear in your fine city, please leave a comment with a way to contact you or shoot us an email at shows@causeascenemusic.com. Much obliged. Today marks a very exciting moment in the history of Cause A Scene. We were graciously asked to present our first show outside the confines of a house in Nashville, and we could not be more thrilled with this show and the insanely talented lineup on board. Today also marks a jumping off point for Cause A Scene, as we are in the process of planning out a full-scale production company with the specific aim of promoting shows around Nashville with the best new talent that we can offer. 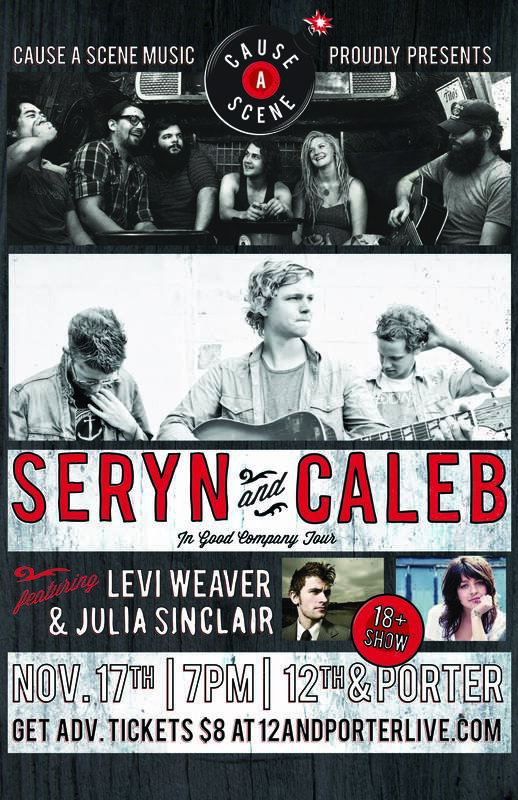 On the night of Saturday, November 17, at 12th & Porter, we will be hosting one of our all-time favorites, Seryn, fresh off their performance in front of 225+ people at our most recent house show and local legends CALEB who if you haven’t seen live, you’re severely missing out. It is very fitting to be hosting Seryn for this show, as they’re the band that really launched Cause A Scene in the first place. We couldn’t be happier to promote these wonderful folks. CALEB (Caleb and Will Chapman, Scott Mills) released the fantastic “To The Ends of the World” EP last fall and are poised to breakout in a huge way in the coming year. These guys might be young, but they possess the musical chops of artists twice their age. As if that wasn’t enough musical goodness for you already, we’ll have the brilliant Levi Weaver and Julia Sinclair gracing the 12th & Porter stage as well. We had the chance to catch Levi close out the SofarSounds Nashville launch in early September are were left nearly speechless at the his sonically and stylistically rich songs that carried the weight and depth of an artist far beyond his years. And as for Julia? Well, we were lucky to have her open the Seryn house show and we could have listened to her play the rest of the night. A true gem of an artist. Tickets are available on 12th & Porter’s website for $8 in advance and will be available for $10 at the door. Hurry and get yours before they’re gone. If Cause A Scene has anything to do with it (and we will), this show will sell out quickly. See you on November 17th! Seryn is a 5 piece band who calls Denton, Texas their home. When listening to the well layered textures of guitars, ukulele, accordion, bass, viola, banjo and various percussion, it’s hard to imagine This Is Where We Are is the band’s debut effort. The band’s strength resides in their vast musical talent and understanding of dynamics. Their beauty is gracefully displayed through chilling harmonies. Each member and their voice carry the same importance. One is not complete without the other. It is in this craft that the young band shines so bright. It has earned them a sound that isn’t easily defined, but still proven triumphant. What may first appear as straight folk songs, later transcend into menacing walls of sound. The term “Folk-Pop” has been thrown around and maybe it loosely fits, but we will leave the definitions up to you. 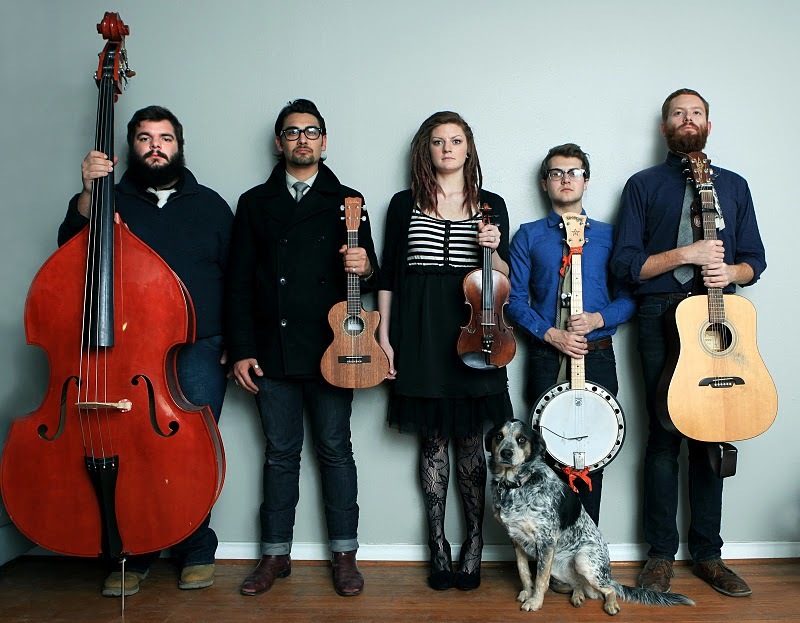 Foreign Fields is an electronic folk group that hails from the wintry plains of Wisconsin. New Years day of last year they met in their hometown, in an abandoned office building, to begin work on their first full length LP “Anywhere But Where I Am”. Having no set plan or guide, the album grew naturally as they left their lives in Chicago for hot summer days, skipping stones in the rivers of Tennessee. 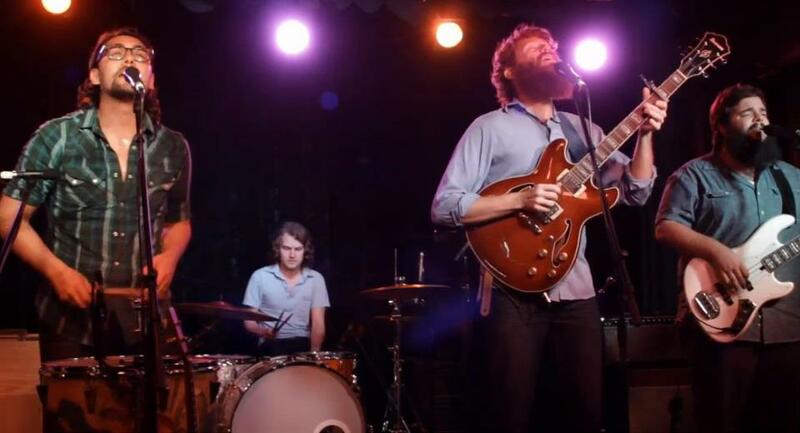 They’ve recently returned to Nashville after a string of summer dates opening for Counting Crows. Most recently, they wowed a sold out Exit/In audience opening for Paper Route. See them now before they start playing much bigger stages. For any musician, getting a record deal or traveling on tour with seasoned, successful artists are the stuff dreams are made of. For acoustic pop songstress Julia Sinclair, those dreams are already becoming reality. She’s opened up for artists like Mat Kearney, Ingrid Michaelson and Graham Colton and is currently working on her debut full length album for ATO Records. All of this before even turning 20 years old mind you! Julia tastefully mixes her classically trained roots and her appreciation for modern pop music to create a sound that is equally balanced between skill and soul. (For a great example of this merging, check out this video of Julia blending her original song “Get Up” with a little of Lady Gaga’s “Just Dance” thrown in for good measure.) After traveling the country and crafting her songwriting voice for the last couple of years, she’s recently planted stakes in Nashville to capture and release those songs onto her first record, which is scheduled to be released later this year. In the meantime, she’s joined up with NoiseTrade to release her new four-song EP, Slow and Steady.